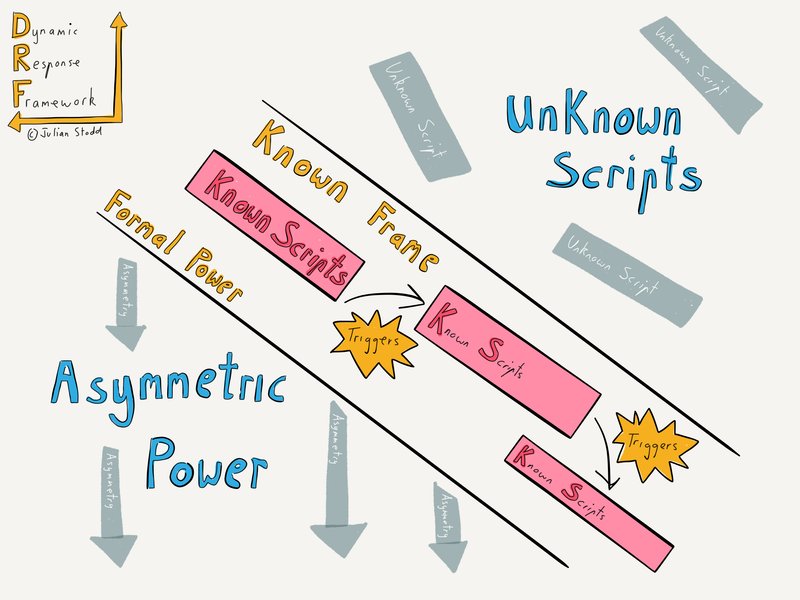 Today I want to explore a number of ways in which systems can fail as a result of this complex interplay of frames, scripts, and power. Frames are the context in which we understand given situation: we are supremely adapted to identifying the frame, and triggering appropriate scripts within it. The risk lies when we misunderstand or mis-categorise which frame we are in. Once that happens, we can be trapped within the wrong frame. In contexts where the framing leads directly to conditioned responses and kinetic action, there is little ambiguity around contextualisation. To avoid being blinded by the frame, we need to hold open a space for ambiguity, at the very time when ambiguity is the enemy of decisive action. To understand this fully we need clear reference point for the type of ambiguity that can remain: it is proposed that the mechanism to do this is a narrative framework that allows a continuous conversation around the validity of the frame, and a safe prototyping space to explore alternative contextual interpretations. A robust system will be socially dynamic: this means fine tuned not only for operational outcomes and single-point decision-making, rather with a deep self-awareness of how those decisions and operational outcomes came to be made. In other words the strength comes from the systems ability to self analyse, self correct, self styled, and self moderate. This kind of system, whilst it may be enveloped by strong hierarchy, needs to contain spaces where social authority prevails. Typically known as tacit or tribal knowledge, this is about the deep wisdom, the learned experience, and the breadth of knowledge that lies distributed throughout the community. If we can build a socially dynamic structure in parallel with a strong hierarchy, we have a system which is both decisive and yet robust. A rigid formal hierarchy, by contrast, is decisive and yet brittle. In fast paced, ambiguous, dynamic, distributed and occluded scenarios, where our sensory array may be incomplete and inputs constantly evolving, it’s important to establish an initial frame. A well developed system may indeed be able to reframe in these early stages, typically any system will fall into a known frame sooner or later. This is because they are responding to known inputs. The challenge with Black Swan type events is that the inputs are not simply unknown, they have unrecognisable even when visible. Almost by definition the context will be misunderstood and the wrong frame applied. To build resilience into the system, we cannot hope to avoid the miss framing, instead we need to building the ambiguity, permission, narrative frameworks and controls to allow the subsequent reframing to occur. Scripts are a series of interconnected behavioural patterns, each one triggered by environmental or social events. But these are not passive: scripts have a deterministic power to trigger other scripts. Whilst cognitively efficient, this leaves them open to subversion by unknown scripts, or delusion by category error. The subversive power of unknown scripts may be maliciously utilised, example in simple phishing scams by email, which utilise known scripts to trigger other known scripts, but without the underlying validity. The outcome is therefore highly undesirable. 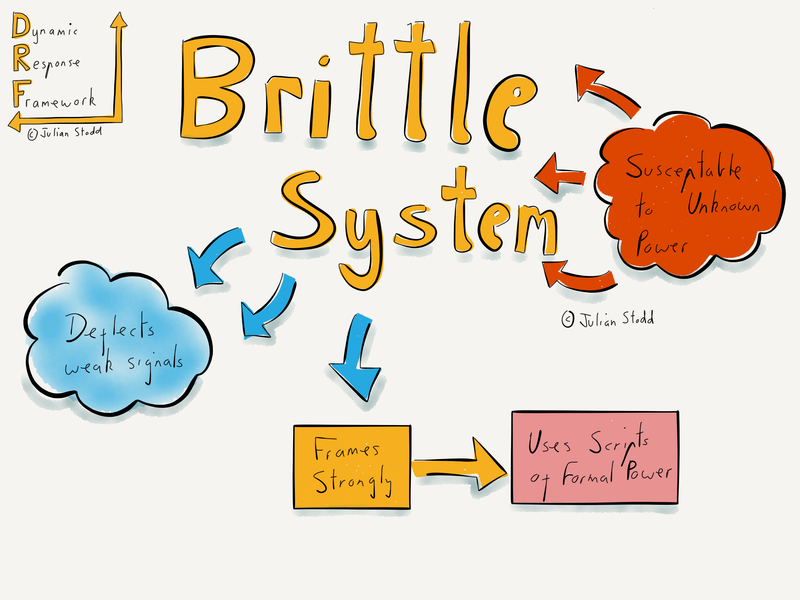 There can be no single approach to diverting scripts or diffusing their power, as their source of power is widely distributed, highly contextual, and even adaptive. Some scripts rely firmly upon the misapplication of formal hierarchical power: they gain their authority through deception. The problem here is that once the script is operating within a known frame, it inherently draws upon the known, formal power. Effectively, once it is past the gatekeeper it operates unhindered. Not only is it unlikely that it will be spotted, but even if it is to challenge is relies on challenging the formal hierarchy itself, which is a high consequence activity. This notion, in which even if the validity of the script is questioned, we tend to self censor to avoid taking action, is a significant risk to formal hierarchies operating within the frames, because left unhindered scripts continue to trigger other scripts taking us deeper into the rabbit hole. This is why when the system fails, it tends to fracture, not fail slowly. There is no gradual questioning of the validity of scripts, but rather a point where the illusion of the whole thing becomes unsustainable. At that point, where we suddenly recognise we are not within a known frame, we often someway in. The need here is to introduce some layer of meta-narrative over individual scripts. it’s hard to de-power the script in isolation, especially bearing in mind the wide range of energies they can utilise, so instead we need a way to capture the isolated clues and draw them together into a wider narrative. The key thing here is that this is a low consequence activity was challenging the script itself is high consequence. To do this we may be able to draw upon semantic analysis of informal chatter within the system, as well as finding ways to introduce dispassionate observation as oversight on the formal channel. The type of power that operates outside of formal hierarchies can be described as informal and often social. One reason why it is often missed or mis-categorised is that it’s inherently distributed, adaptive, contextual and sometimes multilayered. This is best described in geographical context: two neighbours may disagree but unite in defence of a village, two villages may squabble, but unite in defence of a city. two cities may be divided, but be united by two brothers, two towns may be separated by great distance, and yet United through distributed social technologies. Observing the system from the outside in easily quantifiable ways simply gives insight into these complex social systems and highly distributed and contextual power. The response of a formal system to a threat is to identify it and categorise, then take decisive action against it. The challenge of informal power is that there is no single target: the entire social system itself is the power. There is no infrastructure, roads and phone lines are incidental to the distributed web based connections. There is no clear hierarchy, as the power is not captured within a single definable system but rather a multi layered, multivariate, fluid and ever-changing web. We cannot overcome informal power in conventional terms: it cannot be defined on a linear scale, but rather has to be understood as a whole system, and may best be tackled through the magnetism of ideas and counter innovation rather than simply attempts to dismiss or disrupt it. Distributed systems are inherently robust, and whilst pushing may cause it to deform locally, it has little impact on the whole system. to truly affect change change the environment itself, as this type of system is a product of the environment it operates within. The response to informal power can rarely be straight formal power, that tends to trigger a wide variety of scripts in response, and the system is inherently resistant. Instead we need to look to ambiguity and social authority of our own. the best counter to informal power may be other informal power. The delusion of momentum is a significant risk, mistaking momentum for validation of the initial frame. Systems can easily gain internal validity and internal energy leading directly to loss perspective and lack of permission to challenge as we see regularly when formal systems fail. At the heart of resolving the challenge of Black Swan is an ability to pick up on weak signals. Within a formal hierarchy unexpected signals can be seen as either strongly support existing momentum, while highly relevant. Challenges are either made safe or dismissed. The framework within which we observe, Orient, decide and act this strongly geared up kinetic action and building momentum: the challenge is how we retain the right element of ambiguity around this. Within ‘Observation’ it may be a matter of recognising the limiting power of our own perspective and developing a distributed capability as is typical within a socially motivated sense making system. we have to retain the space to argue within the system whilst not compromising the effectiveness of the system. When we are Observing, this is about ensuring we have sight of and a narrative around, the weak signals. When it comes to ‘Orientation’, we then have two parallel narratives to consider: the one of the strong signals and overwhelming perspective, and the narrative of weak signals, and argumentative voices. The ability to navigate these two in a conscious way maybe key to avoiding initial category errors. When we ‘Decide’ we seal the frame in place so the thing we need to do here is to retain a defined and therefore safe space for ambiguity. Whilst this cannot impinge upon the effectiveness of the formal system, hierarchy, and kinetic response, it nevertheless needs to be owned and continuous we are to avoid being swept along by pure momentum. ‘Action’ is the endpoint, invoking known scripts. Here we need to be conscious of the ability of unknown scripts to subversively reorientate the frame. Remember that this point, everything within the known frame, the formal hierarchy, the known power, and established system counts against us when it comes to dynamically recognising, categorising, and responding to Black Swan events. If it seems easy to react at this point, it’s probably not a Black Swan event, but rather an outlier at the extreme edge of the capability of a known system. There is a risk around group mindset within a system which believes it already has the capability to respond to inherently unknown frames. Even an unadapted system may be capable of responding to outlier events, but the true measure of strength is an evolved, socially dynamic and adaptive system that is capable of responding every time because its capability is attuned to the nature of the errors that it may suffer. We could take a view that an adapted system has a distributed sense giving capability. The ability to hear devolved challenge and curiosity at any stage in the process. It’s no coincidence that this adaptive system may bear striking similarities to informally powered systems, because it’s that very capability that it is drawing upon. Indeed we could see the capability as an evolved form of hierarchical power more directly attuned to the realities of the Social Age. This entry was posted in Adaptability, Leadership and tagged Action, Black Swans, Community, Drama, Frames, Hierarchy, Leadership, Military Power, Momentum, Scripts, Social, Social Leadership, Systems. Bookmark the permalink.